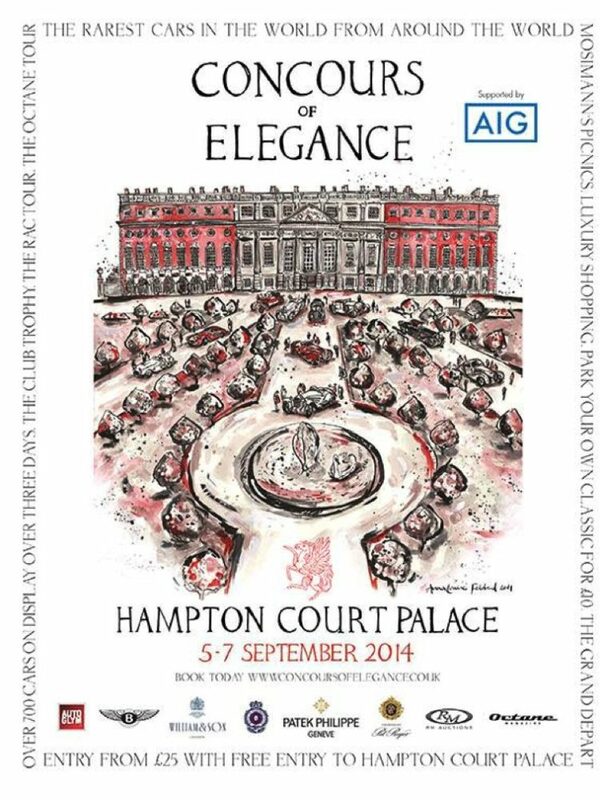 The official poster for the 2014 Concours of Elegance at Hampton Court Palace (5-7 September) is now revealed. Created by the talented New York-based English artist Anna-Louise Felstead, the artwork for the 2014 Concours of Elegance poster depicts a number of the mouth-watering cars set to appear at this September’s event within the Fountain Gardens on the East side of the historic Hampton Court Palace. To the fore of the poster artwork is the exquisite 1931 Alfa Romeo 6C 1750 GS ‘Flying Star, with coachwork by Carrozzeria Touring of Milan. This exceptional Alfa Romeo will be making its British debut at the Concours of Elegance, where it will be joined by 60 of the rarest cars from around the world – the majority of them also never seen before in this country – as well as 700 other fine motor cars from prestigious vehicle manufacturers and the UK’s leading car clubs. Concours poster artist Anna-Louise Felstead is a graduate of both London’s Central Saint Martins College of Art & Design and the Royal College of Art, and famed for her distinctive ink on paper style. Her frequent historic car art commissions – many of which are owned by high-profile figures from the world of motor sport and the automotive industry – are matched by her passion for driving. In the past she has competed in the Historic Monte Carlo Rally and the Tour Auto in an Alfa Romeo Giulietta Ti and TZ1. More information and examples of Anna-Louise’s automotive work can be found at www.alfelstead.com. The annual Concours of Elegance remains unique in being the only automotive event in the UK to enjoy an authentic and spectacular Royal Palace as its backdrop, with keen Royal motoring enthusiast HRH Prince Michael of Kent as the event’s Patron. The 2014 Concours of Elegance at Hampton Court Palace will be open to the public on Saturday 6 September and Sunday 7 September, with entry strictly by advance ticket only. Advance admission tickets are available to purchase now from the new Concours of Elegance website (www.concoursofelegance.co.uk). Limited edition Concours of Elegance Posters and Souvenir Catalogues from the previous award-winning Concours events can be purchased now from the website, with the 2014 poster and other official mechandise also available to order at: https://concoursofelegance.co.uk/coe2017_wp/2014-event/merchandise/.